New 2019! This lower unit is a well appointed home and is the perfect location for your vacation destination. (The upper unit of this property is owner occupied) This unit will be fully furnished before the summer, updated photos to come!! Plus only minutes away from all of your favorite "Things To Do!" This unit is one of two in a beautiful Muskegon Beach house! 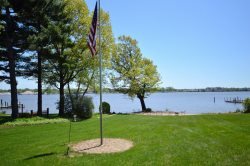 The property sits right in between Lake Michigan and Muskegon Lake, and only 1 1/2 blocks from Pere Marquette Beach. This recently renovated home features beautiful hard wood floors and modern appliances. In Bedroom #1 you will find a King bed. Bedroom # 2 features a Twin over Full bunk bed. Lastly there is a sleeper sofa in the living room!